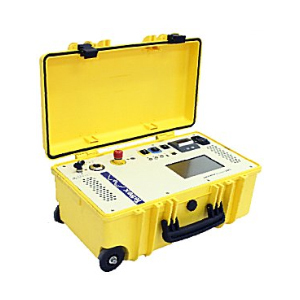 Capacitance, dissipation / power factor testing. Compact one-box design weighs only 25kg. Variable frequency 15Hz to 400Hz. Accuracy of 0.3% (capacitance) and 1 x 10-4 (tan delta). Safe operation with interlock, emergency stop, safety checks and HV ground surveillance. 7-inch touch screen for easy operation. Three operating modes: basic, guide, advanced. 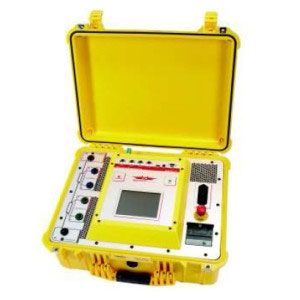 Hipotronics MIDAS micro 2883 Insulation Diagnostic and Analyzing System, with built-in rugged case with casters. • High Voltage cable, 20m with clamp. • 3-shielded measuring cables 20m, with clamps. • High voltage ground cable with clamp. • Safety interlock hand switch, 10m. • 2 mini clamps with cables. • 3 bushing tap adapters 4mm.